Having food poisoning and the aftermath of not really enjoying eating the past week really hampers one’s motivation to post about food. Even going through my Oaxaca photos has been difficult, because I look and with each photo I try to figure out, “is that the dish that made me sick?” or “should I really have eaten that after I got food poisoning?”. I thought I’d travel back to my LA trip and post some of the leftovers I have from my adventures there a few weeks back. My second version of my perfect day in LA with Ben takes place on Sundays. We usually get a slower start to the day after a fun night out on Saturday, (this year we were at Red O). We hit the gym in the morning to sweat the bad stuff out and then visit the Whole Foods for some wonderful smoothies and treats. A quick relax at the pool and then we’re off to hang out at the Grove. The Grove isn’t as much about the shopping as it is the people watching and getting to wander around outdoors. It’s a great experience and one of my favourite things to do on the weekend in LA, (my other is going to the Santa Monica Farmer’s market on Saturday). 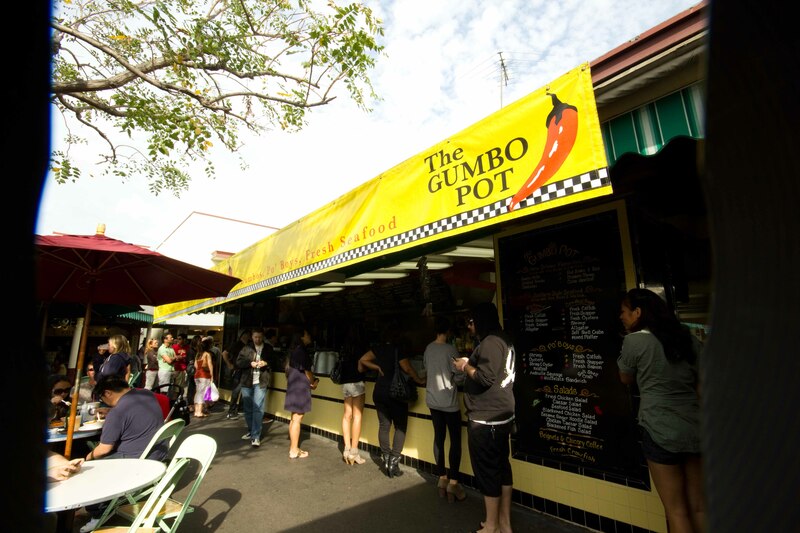 Of course at the Grove, they have their own Farmer’s Market, which isn’t really a market but a food court area, with a fantastic selection of yummy eats. My problem is that I enjoy the 2 I go to so much that I haven’t branched out much over the years. Even though I went to Loteria Grill a few days before, I went back for a Pollo en Pipian Rojo tostada, (chicken with spicy pumpkin-seed & peanut sauce). 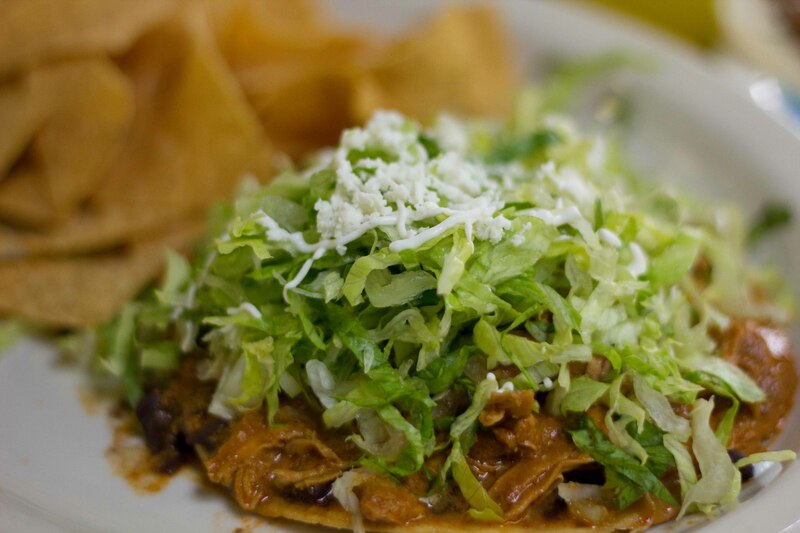 I like the idea of the tostada because it comes with lettuce, so it makes me feel like I’m getting my greens. 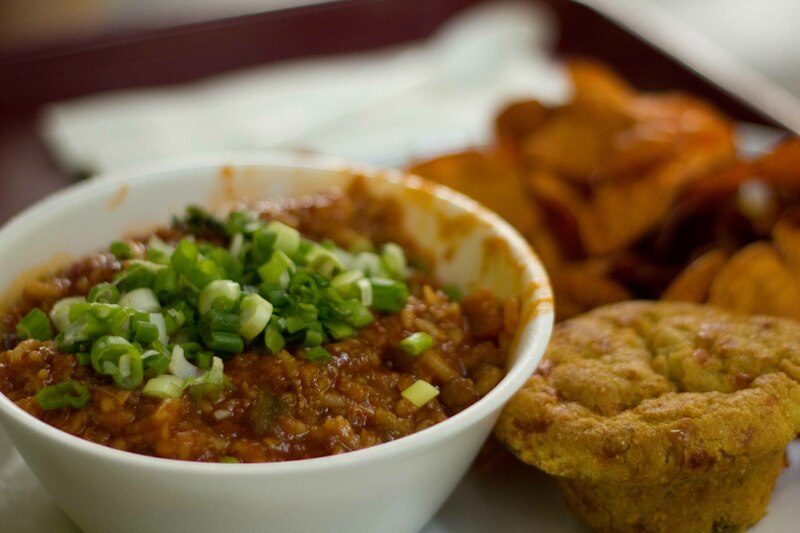 Ben got a bowl of jambalaya w/ cornbread and sweet potato chips. Add some drops of a few different hot sauces on top to make the bowl sing. While Ben always gets the Jambalaya, I’m more a fan of the blackened snapper po’boy. A lot of people order the beignets and cafe au lait. Maybe next time. For our Sunday evening activity, it was a toss-up between going to watch a Lakers game, or watching a movie. While it’s always hard to pass up going to watch Kobe in “his house”, I knew that this would be my only opportunity to have a movie night in the city as well. There’s nothing like going to watch a movie in the town where movies are made. I don’t know if it’s because I save good movies to watch in LA, or if it’s LA that makes the movie better, but Tinseltown holds some of my best movie memories. 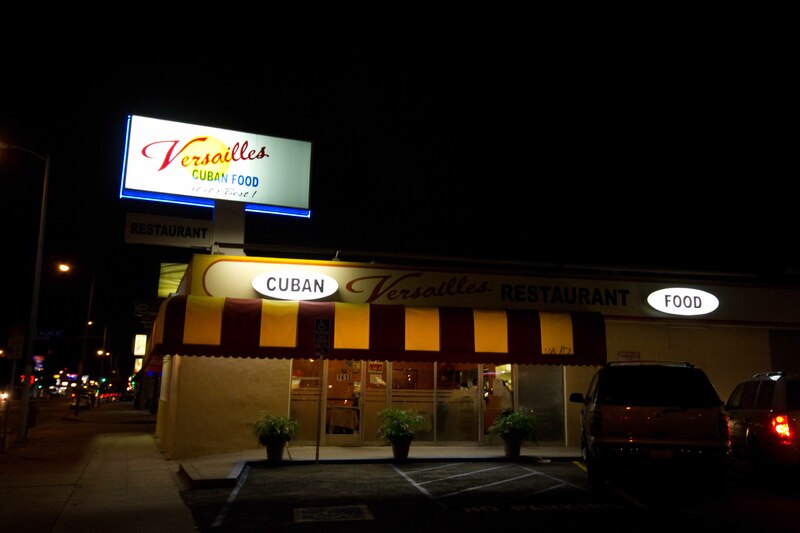 With our seats chosen in advance (gotta love that), we went to another favourite for a cheap and easy meal at Versailles Cuban restaurant for some delicious garlic chicken. There are a few of these around the city, but this one on La Cienega is the one we go to. The restaurant is usually very busy, but early on a Sunday, we walked right in. I like yucca, but rarely see it on a menu. 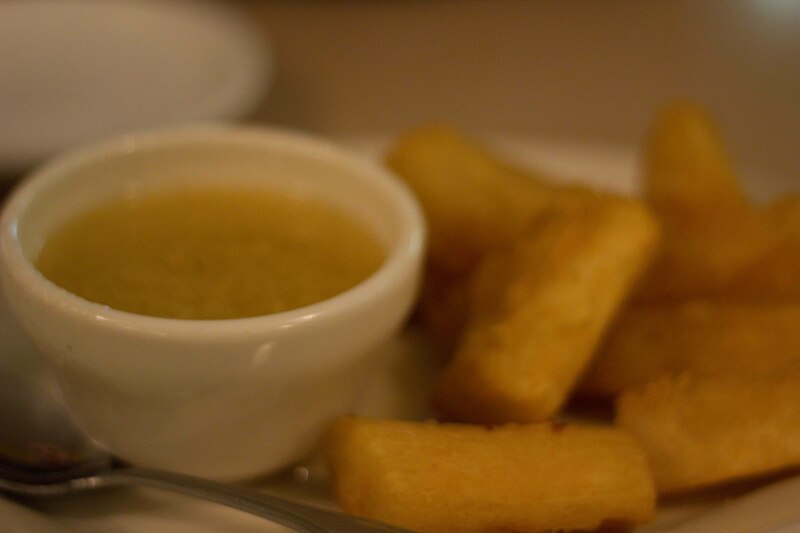 These fried yucca were hot and crispy on the outside and soft on the inside, but too filling an appetizer for just the 2 of us. 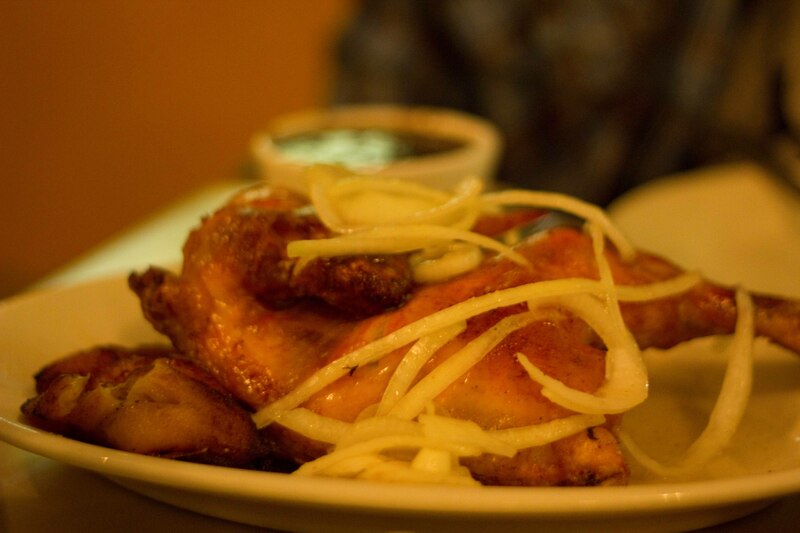 The reason to come to Versailles – Famoso Pollo Versailles, marinated and roasted in mojo (garlic sauce) which is also served on the side. This is extremely garlicky and definitely not first date stuff. A side of black beans & rice perfectly compliment the dish. We were totally full, but saved room for a movie treat of “mix-in’s”, small bite sized chocolate bars, (the small round pieces of Skor, Mars or Rolo are best) mixed in with a bag of popcorn. The savoury sweet combo may sound weird, but it’s great. And if you’re curious, we watched “127 Hours”. It was intense, but a fabulous movie and James Franco will totally get an Oscar nomination for his performance.